BODI is now half blind. Bodi, born May 19, 2017, was given to Ianne Meneses Rebulo as a birthday gift by her friend Jenn. 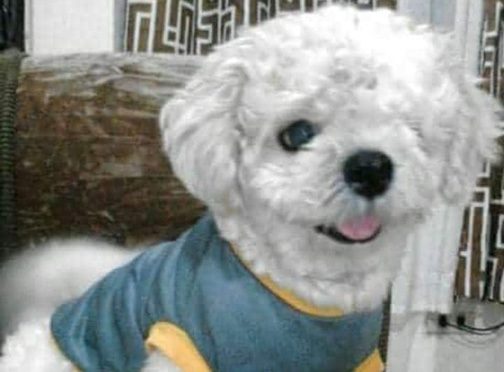 Bodi lost his left eye when an adopted dog of Ianne, a Siberian husky named Nickey, was startled upon seeing someone—Bodi—following him on his way to the kitchen. His first instinct was to attack that someone. Ianne said Nickey did not immediately realize it was Bodi. Bodi remains a playful, sweet dog despite the incident, Iaane said. Bodi sometimes sleeps with Ianne and her husband in their room with another dog named Samsam. Bodi also loves being carried and swayed like a baby when they go to their room to sleep. Ianne said Bodi is spoiled. They would put Bodi’s food in a spoon and feed the dog while lying down when the dog doesn’t like the food. But when you kiss him. Bodi will lick your face continuously as if he is saying “thank you” and to tell her he loves very much. Months after losing an eye, Bodi’s platelet count went down due to erlichia. But Bodi is a fighter and he survived the illness after a month of medication. Ianne said they continue to monitor his health and they have his good eye (right) checked always. KIMMIE filled the void in the lives of Zay Ignote Roldan and her husband, Ericson Roldan. Zay had a rocky relationship with her husband before 2014. They were both distraught after Zay underwent surgery for myoma. Because of the surgery, Zay can no longer have a child. They joined Couples for Christ which helped them a lot. But they were still unhappy, she said. On May 10, 2014, Kimmie was born. A member of Couples for Christ gave Kimmie (left in the photo) to them. Since that day, Zay said their married life changed. “Our life, in an instant, changed drastically. We felt happy because having Kimmie is like having a child. “ Zay said. “I am very attached to Kimmie. When she was three weeks old, she would sleep on my chest, “ Zay said. Her husband loved to come home to hug and play with, Zay said. “We gave all our love and attention to Kimmie, specially since Kimmie is sickly, “ Zay said. Zay admitted to always being nervous about KImmie’s physical condition. When she and her husband would talk about the possibility that they might lose Kimmie, they would always cry. Because of this, they decided to get another furbaby. But they assessed first if they still have the time and attention for another dog. Many wanted to give them another dog but Zay said she did not want to just get another dog. She posted her intention to adopt. “By Divine intervention, one day I felt I was ready. 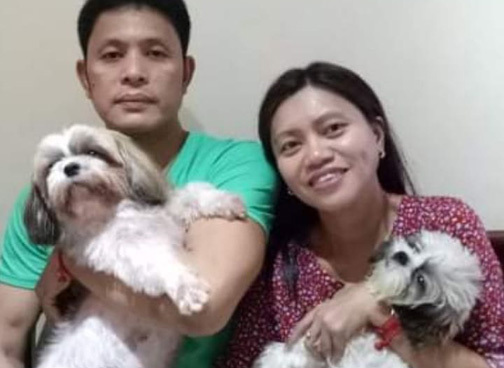 I also declared our next baby will be a healthy and playful shih tzu,” she said. “Zian, then six months old, came into our life. We adopted Zian, “ Zay said. For the second time, Zay said she became a “mom” and she is very happy. Editor's note: These stories were compiled by admin Miks Lim of Save Animals of Love and Light (Save ALL), a SEC-registered animal welfare group that helps animals in need, and encourages and promotes responsible pet ownership, adoption of rescued dogs and cats from fosters, shelters and pounds, and spaying and neutering of pets to control animal population in the country, among others.